Ensure that the fuel level in the tank is less than1/4-full. If necessary, drain the fuel tank to at leastthis level. Refer toFuel Tank Draining. Relieve the fuel system pressure. Refer toFuel Pressure Relief.Disconnect the negative battery cable. Refer toBattery Negative Cable Disconnection and Connection.Raise and support the vehicle . Refer toLifting and Jacking the Vehicle.Remove the exhaust system. Refer toExhaust Muffler Replacement. Disconnect the canister vent valve electricalconnectors.Disconnect the vent hose from the canister filter.Disconnect the fuel tank vent pipe from the evaporativeemission canister. 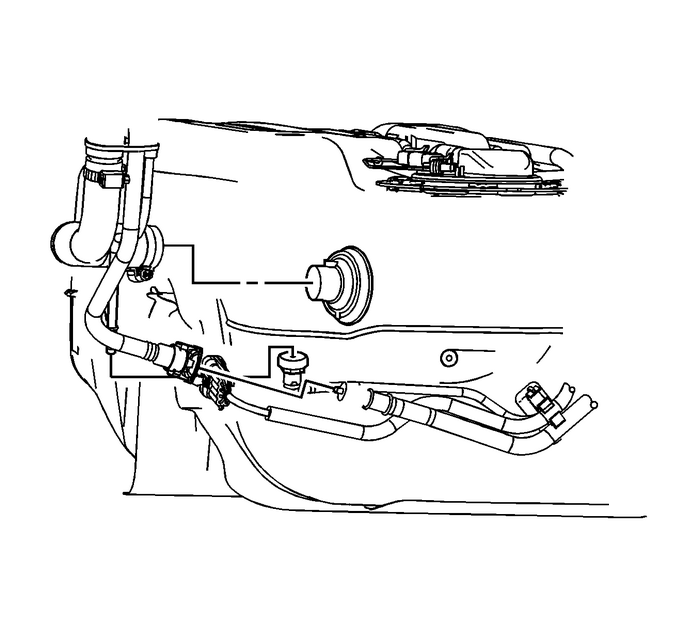 Caution:Clean all fuel pipe connections and surrounding areas beforedisconnecting the fuel pipes to avoid contamination of the fuelsystem. Disconnect the chassis fuel supply line-(2) fromthe fuel tank. 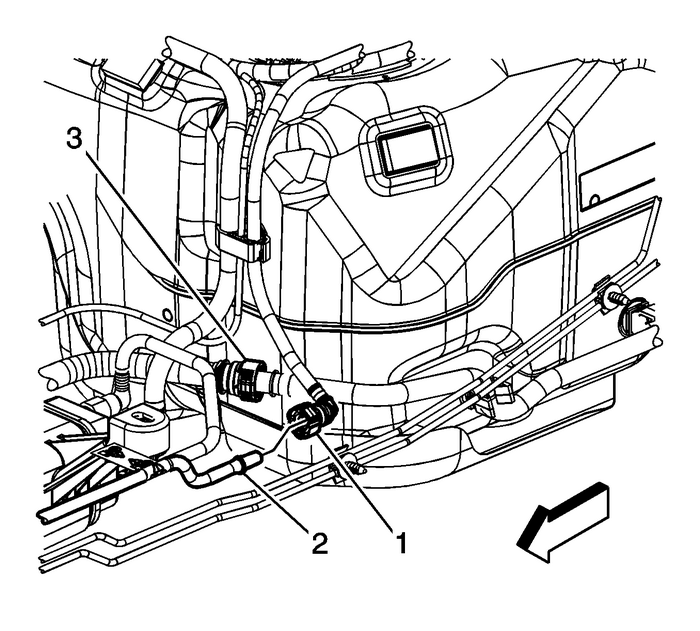 Disconnect the fuel filler tube, EVAP vent hose, and freshair hose from the fuel tank.Disconnect the fuel tank electrical connector and remove theelectrical connector retainer from the rear frame. Caution:Do not bend the fuel tank straps. Bending the fuel tankstraps may cause damage to the straps. Note:Do not lower the rear frame. It is not necessary to lower therear frame for fuel tank removal. Support the fuel tank using a suitable jack.Remove the fuel tank strap nuts, and lower the fuel tankstraps.Lower the fuel tank from the underbody of the vehicle.If replacing the fuel tank, remove the fuel tank moduleassemblies. Refer toFuel Tank Fuel Pump Module ReplacementandFuel Tank Fuel Pump Module Replacement - Secondary.If replacing the fuel tank, remove the heat shield, hoses andwiring harness, and transfer to the new tank.Installation ProcedureIf previously removed, install the fuel tank moduleassemblies. Refer toFuel Tank Fuel Pump Module ReplacementandFuel Tank Fuel Pump Module Replacement - Secondary. Using an adjustable jack, slowly raise and reposition thefuel tank-(3) in order to install the tank to thevehicle. Install the fuel tank straps and the fuel tank strap-to-bodynuts and tighten to20-Y(15-lb-ft). Connect the fuel tank electrical connector and install theelectrical connector retainer to the rear frame.Connect the EVAP vent, and fresh air hoses to the fueltank.Connect the fuel filler tube to the fuel tank. Tighten thefuel filler tube clamp to5-Y(44-lb-in). Connect the chassis fuel supply line-(2) to thefuel tank.Connect the fuel tank vent pipe to the evaporative emissioncanister.Connect the vent hose to the canister filter.Connect the canister vent valve electrical connector.Install the exhaust system. Refer toExhaust Muffler Replacement.Lower the vehicle .Fill the fuel tank with gasoline.Connect the negative battery cable. 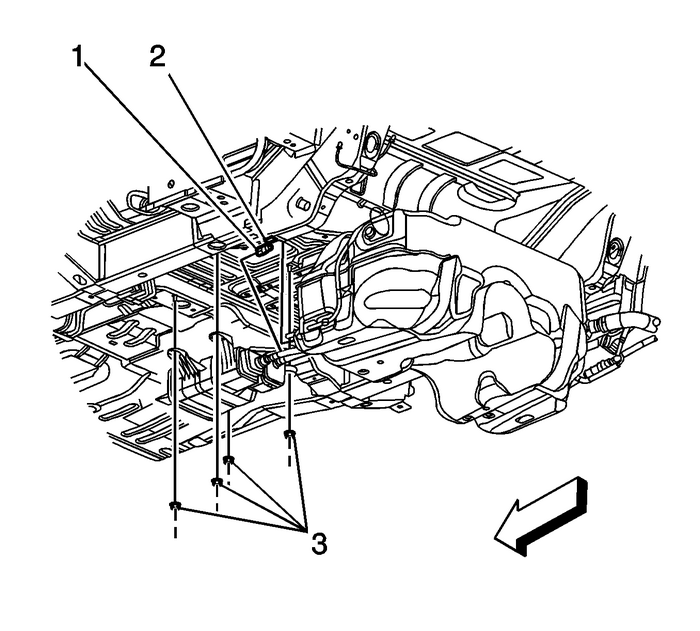 Refer toBattery Negative Cable Disconnection and Connection.Prime the fuel system:Cycle the ignition ON for 5-seconds and then OFFfor 10-seconds.Repeat the previous step twice.Crank the engine until it starts. The maximum starter motorcranking time is 20-seconds.If the engine does not start, repeatsteps-15.1–15.3.